Peter and Sarah are uncle and niece. For many years they have been in conversation about the themes of this pamphlet, influencing each other’s thinking and practice. This is a collaborative work, intended as the first in a series, a first step toward sharing those conversations more widely. 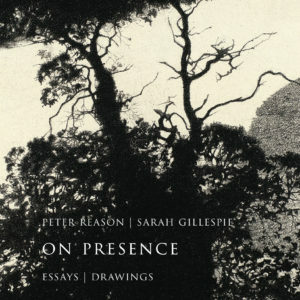 On Presence draws together writing and drawing reflecting on the living presence of the world, a world experienced not as a collection of inanimate objects but as a community of life we can encounter and of which we are a part. This beautiful and engaging pamphlet aims to convey some of this experience. Peter Reason is a writer who aims to link the tradition of nature writing with the ecological crisis of our times, drawing on his direct experience, and on scientific, ecological, philosophical and spiritual sources. His two books, Spindrift: A wilderness pilgrimage at sea and In Search of Grace: An ecological pilgrimage weave explorations of the human place in the ecology of the planet into stories of sailing voyages. You can buy this beautiful little pamphlet from my editions page.